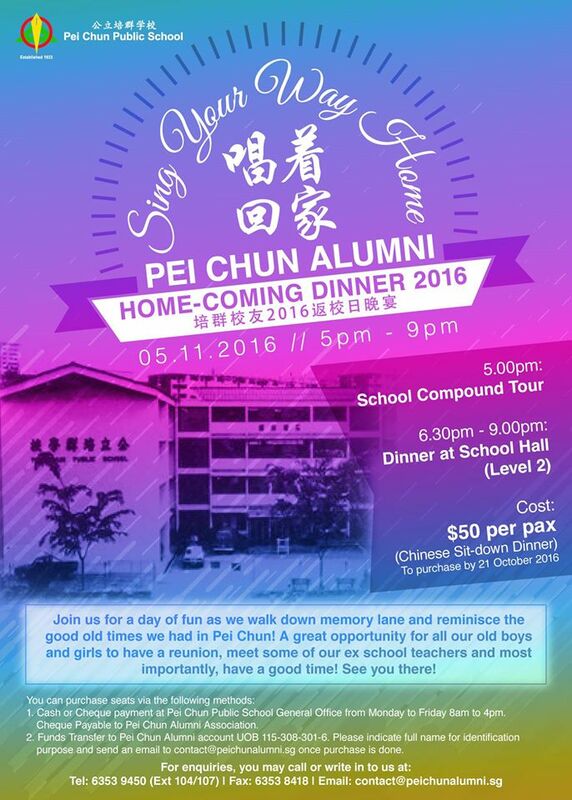 We cordially invite all Pei Chun Public School Alumni to this event organised by our Alumni. The theme for our Home-Coming is – “Sing Your Way Home”. This familiar theme will resonate with some of us who recall singing this song during our school days. For this event on the 5th of November 2016, not only will you get to meet up with some of your former teachers and classmates, there will also be exciting programmes lined up which include a walk down memory lane as we make a visit to the old school compound, now occupied by HSR beside the school's sports hall. Be sure to take many photographs of the old school premises where we once shared all our moments together! Powered by Joomla!. Designed by: Spring Flowers Valid XHTML and CSS.